The government has announced £201million for road resurfacing and resilience against potholes and flooding. 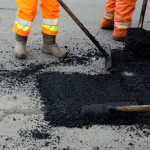 The fund will be allocated to councils across the UK for road resurfacing and research into new technology that can prevent potholes and improve resistance to bad weather. Techniques to improve roads, such as new materials, 3D printing, and innovative pothole repair techniques, will also receive funding. From the fund, £50million will be given to resurfacing and repair and £151million will reward councils for best practice. A hub will also be established to allow organisations to share new ideas. New technology is currently being trialled by various councils, including a partnership between north-east Lincolnshire council and ENGIE developing recycled road surface material mixed with new components that creates a thermo-bond and prevents water from entering the surface. In Cumbria, low-cost sensors are being trialled to monitor river levels in the county. The government has also promised funding for research into ideas such as kinetic energy used to heat surfaces and waste plastic recycled into resilient road surface materials. In the last six months, £420million has been funded for resurfacing, pothole and bridge repairs, and a further £725million is due to be awarded to councils based on how well they maintain infrastructure. The funds come from the £6.6billion set aside by the government to improve the quality of local roads. The Department of Transport will be leading projects in pothole repair and new road surfaces that are sustainable, durable, and able to withstand extreme weather and years of use.